The white page blinded me at first. It took a moment for my eyes to filter out the glare. It may have been better to be blinded by the white. A think black line flashed at me. 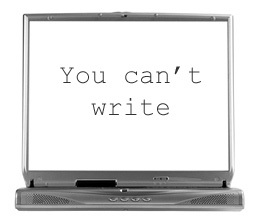 “You can’t write. You can’t write. You can’t write.” The more I watched it the more I became convinced it was dancing while it taunted me. My eyes fluttered between the two mirages – one promised crushing discouragement and the other promised relaxed distractions. Sanity finally made a show and dismissed them both. “No we aren’t.” It struck me that two such opposite venues would suddenly agree and that rationalization helped to bolster my sanity. I looked at the two again. The dancing had stopped. Now I saw a computer and television. Neither one had the power that they seemed to hold just moments before. “Write something.” My sanity stood next to me and urged me to push forward. I wrote something. It was only seven words. “The white page blinded me at first.” Those words led to a few more words and before long I had a story flowing out. – a blank screen will stay blank until I put something down. It does not have to be award worthy, but it does have to be something. If nothing else, the words I put down will help to deflect the glare from the empty white page. – avoid distractions. You can find inspiration anywhere, but the television often does more to steal inspiration that to drive it. If you must watch television then be sure you have specific shows to watch and that you limit the time. – make it work. Take the struggles that you are facing and let them be a lesson (to you and to anyone else that wants to read the words). There will always be a reason not to do what you know will lead to your success. But one step will often make it easier to take the next step. Push back the excuses and move. Before long you will discover that the blank screen transformed into a full-blown article and you are now one step closer to the writing career you desire.